Competition in the Web hosting market continues to rise. The latest example involves Salesforce.com, which has unveiled a new service -- called Force.com Sites -- that allows customers to run their Web sites in the Salesforce.com cloud. The move comes only a few days after Microsoft launched its Azure cloud services. Competition in the Web hosting market continues to rise. The latest example involves Salesforce.com, which has unveiled a new service — called Force.com Sites — that allows customers to run their Web sites in the Salesforce.com cloud. The move comes only a few days after Microsoft launched its Azure cloud services. For managed service providers, the growing list of cloud services from which to choose can seem overwhelming. But we’re in a hype cycle and I expect many cloud services to disappear into vapor over the next few years. Here’s why. Generally speaking, big publicly held technology companies are desperate to position themselves in the software as a service (SaaS) and cloud computing markets. All of the major industry research firms — from Gartner to International Data Corp. — are telling their clientele about the shift to on-demand services. And traditional on-premise solutions have lost their shine. I do believe in cloud and SaaS services. But I expect a hybrid approach to emerge, where customers mix and match their on-premise options with cloud services. A prime example involves an on-premise storage solution (such as Symantec Backup Exec) integrated with a cloud service (such as Symantec Protection Network, SPN). Symantec has been developing an agency sales model so that MSPs can profit from SPN. We’re also seeing examples of MSP-specific software (such as Vembu StoreGrid) plugging into such cloud services as Amazon’s Simple Storage Service (S3). Still, it takes millions of dollars to build and maintain data centers for cloud-based services. While companies like Amazon.com and Google have excess capacity in their own data centers, I do sometimes wonder if their cloud services are a hobby or a core focus of their long-term business strategies. 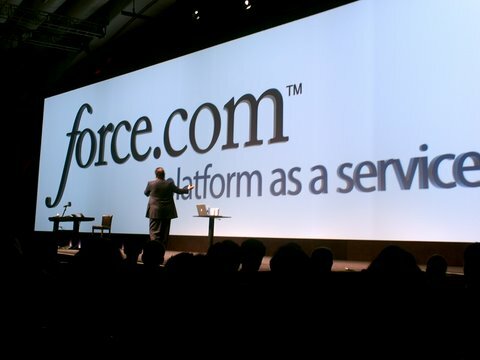 While Force.com won’t be generally available until calendar year 2009, Salesforce.com mentioned numerous companies that have already tested and used Force.com to deploy applications. Early adopters include Astadia (a global systems integrator) and Appirio (a Web 2.0 site development firm). Good observation. Looks like the next bubble will be in the cloud where every large vendor would be trying to become a cloud platform. I have a feeling salesforce.com is getting too ambitious here. They do not have the deep pockets of a google or a microsoft or the expertise of an Amazon. Their profit margins in their current business are quite low. So they are desperately trying to become a platform. I am doubtful about their strategy. They will be better off staying focused at the application layer leaving the bottom layer of the cloud infrastructure to others. On your comment “But I expect a hybrid approach to emerge, where customers mix and match their on-premise options with cloud services”, we at Vembu also strongly believe in a hybrid approach. In that context I think Microsoft’s software plus services approach seems to make the most sense. But whether Microsoft would execute this right is another question. Sekar: Thanks for your perspective. MSFT’s approach (software + service) does make the most sense. But they’ve alienated a few partners by offering SaaS direct (as an option). Microsoft really had no other choice in the matter but I don’t think VARs will forgive the company for making that direct SaaS move. You’ll find another follow-up blog from Vembu here. The topic is backing up to the cloud. Full disclosure: Of course blog is vendor-specific but it does offer some more info on how cloud-based storage works.